Yum, these fries look delicious! You could add them to a child's shirt, apron or a place mat. 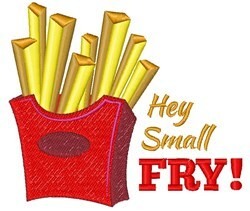 Windmill Designs is happy to present Hey Small Fry! machine embroidery design which has 8739 stitches and is [88.27 mm x 77.52 mm] large. If you would like to view more embroidery patterns please search on our embroidery designs page.